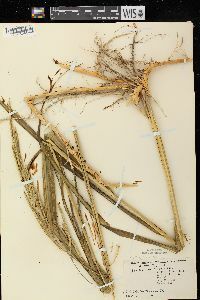 Plants strongly rhizomatous; rhizomes elongate, (2)3-8 mm thick, purplish-brown or light brown (drying white), scales closely imbricate. 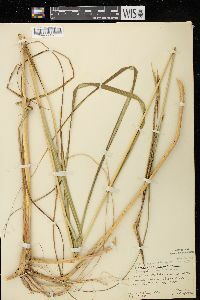 Culms to 250 cm tall, 2.5-11 mm thick, solitary or in small clumps, indurate. 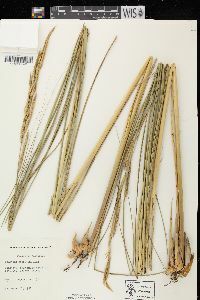 Sheaths mostly glabrous, throats often pilose; ligules 1-3 mm; blades 20-96 cm long, 5-15 mm wide, flat when fresh, becoming involute when dry, glabrous on both surfaces, margins strongly scabrous, blade of the second leaf below the panicles 32-96 cm long, 5-14 mm wide, usually involute. 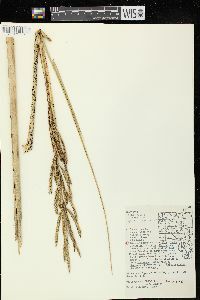 Panicles 10-50 cm, not smooth in outline, with 5-50 branches; branches 1.5-15 cm, appressed to somewhat spreading, with 10-80 spikelets. 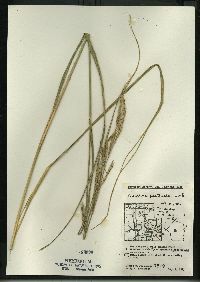 Spikelets 10-25 mm. 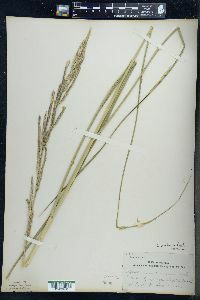 Glumes shortly awned, glabrous or sparsely hispidulous; lower glumes 5-10 mm, from 3/4 as long as to equaling the adjacent lemmas, keels hispid, apices awned; upper glumes 10-25 mm (including the awn), exceeding the florets, glabrous or sparsely hispid, keels scabrous to hispid, trichomes about 0.3 mm, lateral veins usually glabrous (rarely hispid), on either side of, and close to, the keels, apices awned, awns 3-8 mm; lemmas glabrous, keels pectinate distally, apices bilobed, lobes 0.2-0.9 mm; anthers 4-6 mm, well-filled, dehiscent. 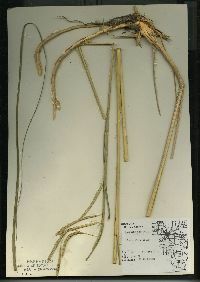 2n = 40, 40+1, 80 [42, 70, 84]. 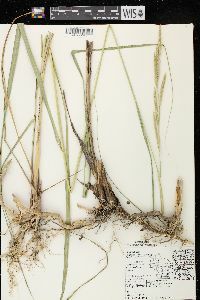 Spartina pectinata is native to Canada and the United States, but it has been introduced at scattered locations on other continents. 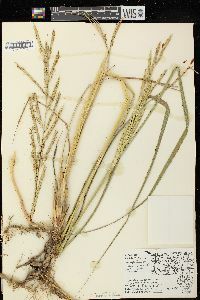 On the Atlantic coast, it grows in marshes, sloughs, and flood plains, being a common constituent of ice-scoured zones of the northeast and growing equally well in salt and fresh water habitats. 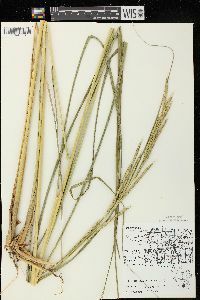 In western North America, it grows in both wet and dry soils, including dry prairie habitats and along roads and railroads. 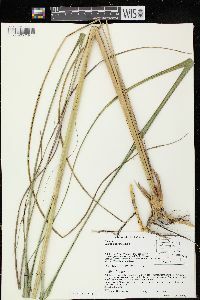 Spartina pectinata is thought to be one of the parents of S. ×caespitosa, the other parent being S. patens. 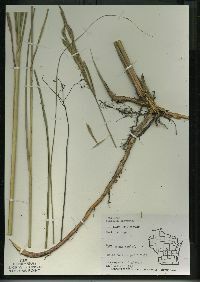 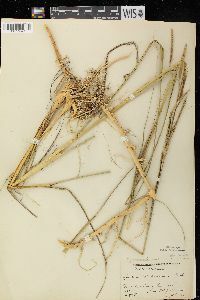 Perennial rhizome-forming herb to 3 m tall Leaves: having open sheaths with softly hairy throats but are otherwise hairless and ligules that are 1- 3 mm long with the hairs along the margins being longer than the membranous base. 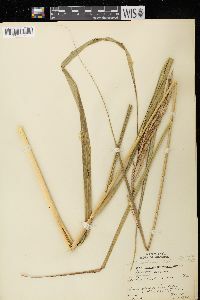 The blades are 20 cm - 0.96 m long, 5 - 15 mm wide, flat, the margins rolling toward the upper surface of the midvein (involute) when dry, hairless, and rough along the margins. 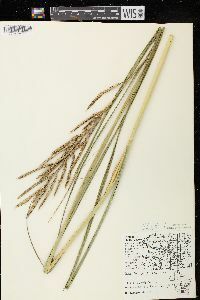 Inflorescence: terminal, branched (panicle), 10 - 50 cm long, rising above the upper leaves, with five to 50 branches that are 1.5 - 15 cm long and appressed to slightly spreading. 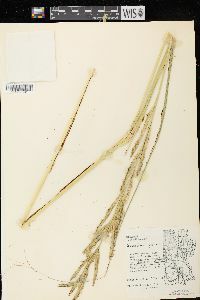 Fruit: a caryopsis, rare. 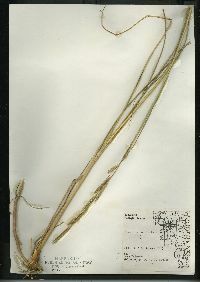 Culm: to 2.5 m long, single or in small clumps, erect, 2.5 - 11 mm across, circular in cross section, hardened. 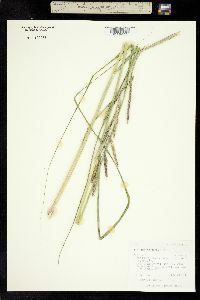 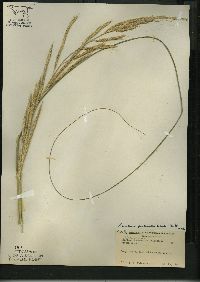 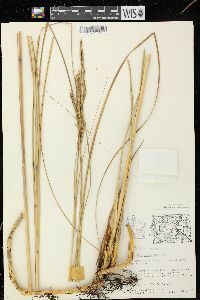 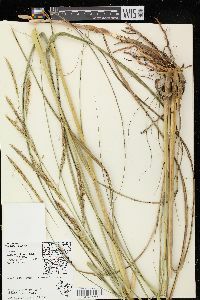 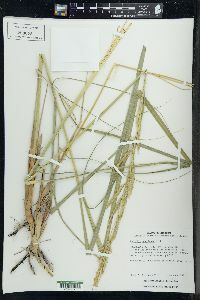 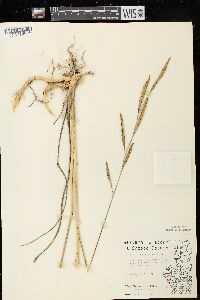 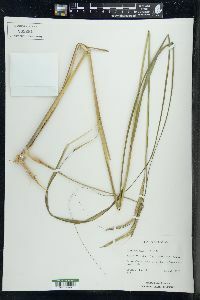 Spikelets: ten to 80 per branch, 10 - 25 mm long, laterally compressed. 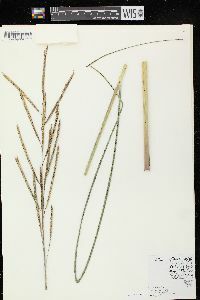 Glumes: unequal. 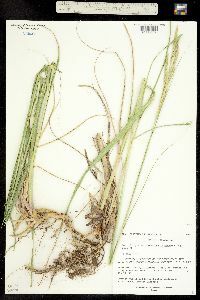 The lower glume is shorter than the florets, 5 - 10 mm long with a stiff bristle tip, single-veined, with a stiff-haired longitudinal ridge. 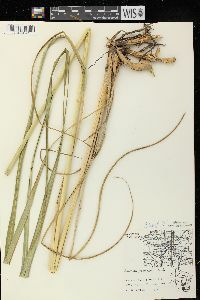 Upper glume longer than the florets, 10 - 25 mm long with a 3 - 8 mm stiff bristle tip, hairless or sparsely stiff-haired, with a rough to stiff-haired longitudinal ridge. 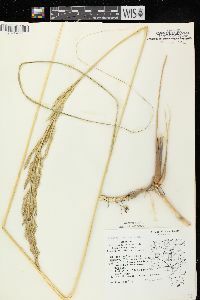 Florets: one per spikelet, with three anthers 4 - 6 mm long, and two feather-like styles. 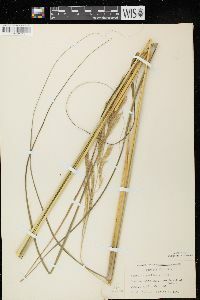 Lemma: shorter than the palea, hairless, having a two-lobed tip with 0.2 - 0.9 mm long lobes and a longitudinally ridged midvein that is comb-like near the tip. 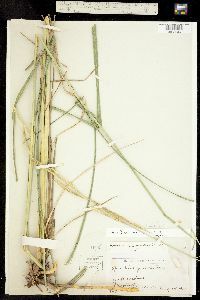 Palea: two-veined, thin and papery. 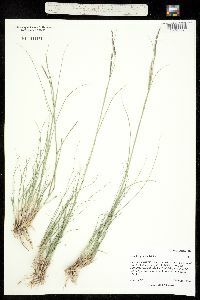 Habitat and ecology: Common in wet prairies and sometimes seen in mesic prairies. 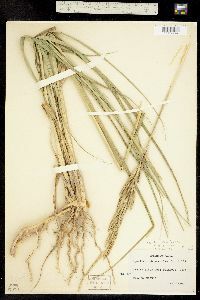 Etymology: Spartina comes from the Greek word sparine, meaning cord. 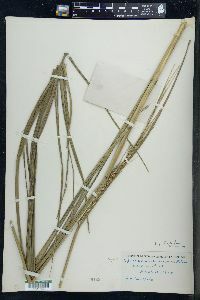 Pectinata means comb-like. 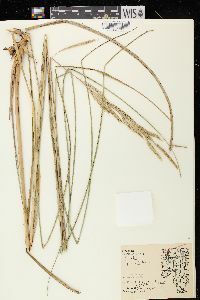 This species is infrequent or rarely frequent and seems to be restricted to the lake and prairie areas and to the slope of the bank of the Ohio River, usually in crevices of shale. 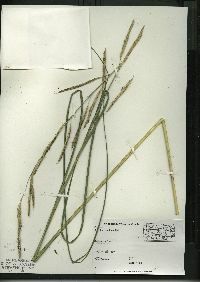 In the lake area, it is found on the low borders of lakes and streams and in marshy places. 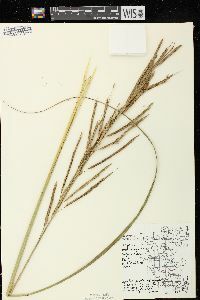 In the prairie area, it is found in wet places, usually closely associated with Calamagrostis canadensis.